Actor, comedian and filmmaker Tyler Perry is back at it with an A-list cast for his first R-rated comedy "Nobody's Fool," and he's hoping this movie will "reignite" things for one EGOT-winning actress. The celebrity cast includes Tiffany Haddish, Tika Sumpter and Whoopi Goldberg to name a few, but Perry said this morning on "GMA" that Goldberg's return to the big screen is a chance to remind "people how great and funny she is." "I think she was just at a place in her life where she just needed that reassurance and to be able to give that to her and have her show up in this movie and be as funny as she is and remind all the people how great and funny she is on film, I'm hoping that everything just reignites for her again," Perry said. "Because Whoopi is amazing and she's wonderful." Later, on "The View," Perry said he was "honored" that Goldberg wanted to be in the film. "I was writing the mother role and I thought, 'Oh, if she would do this I would be so honored.' I called and when she said 'yes,' we were all like, 'Oh my God. She is coming.'" While sitting at the table alongside Goldberg, the show’s co-host, Perry suggested adding another film to her resume. "I think there should be a new 'Sister Act' [with] Tiffany Haddish and Whoopi Goldberg in 'Sister Act 3.' That's what's happening," the director said. Perry also gushed about Haddish, who he predicts will "blow people's mind" when she inevitably branches out from comedic roles. "She is a professional and she's not a flash in the pan," he said. "This girl is smart and she's only showing you one side. She's got some gears and when she gets into other stuff she'll blow people's mind with her dramatic stuff." Perry said he wrote this film specifically for Haddish and explained that he let the hilarious cast "just go." "This is my first rated-R comedy. So all the little grandmas who like to go see 'Madea' just know this is a Rated-R comedy," Perry said, laughing. "And I am excited about it. Because you can't have them in the movie and make it PG-13 so I just let them go and I'm excited about it." 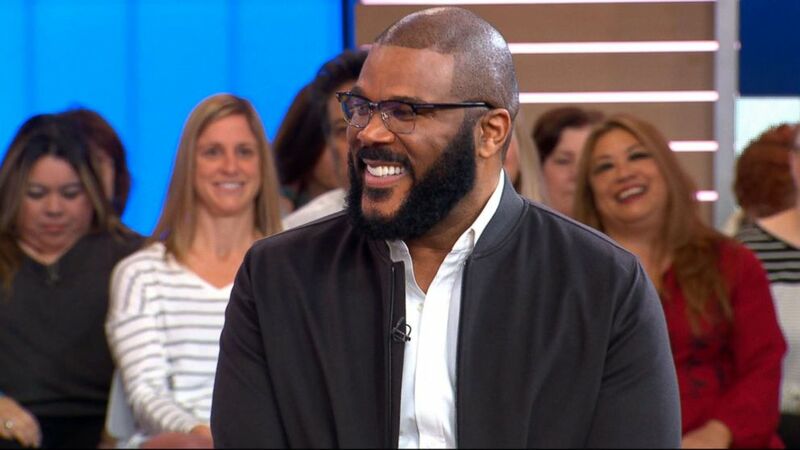 Tyler Perry appears on "Good Morning America," Oct. 30, 2018. Perry also confirmed that the final movie in his "Madea" franchise will be out next April. "I don't want to be her age playing her," he explained. "She's had a great run and had a really, really great run. It's time to move on." Perry will always be known for more than just his outlandish characters. "It's all about legacy, though, seriously. It's all about legacy," he said. "What I leave for my son. I've been holding the door open for a lot of people who are coming to work as underdogs. There was a time when a lot of people of color couldn't get work and worked with me." He added, "I'm trying to hold the door for the next generation because I feel like I've done all I wanted to do thus far." Goldberg told Perry on "The View" that he is the embodiment of "the American dream." "I can't say enough about this man -- what he does for actors and what he has done for Atlanta, what he has done for people who want to work, there is nobody better," she said. "This is the American dream. This man embodies it, and just so everybody watching, male, female, young, black, white, doesn't matter. Dreams come true if you work your tail off. This is proof. Tyler Perry is proof of that." "Nobody's Fool" hits theaters nationwide Nov. 2.